Who said auntie can’t have some fun too? 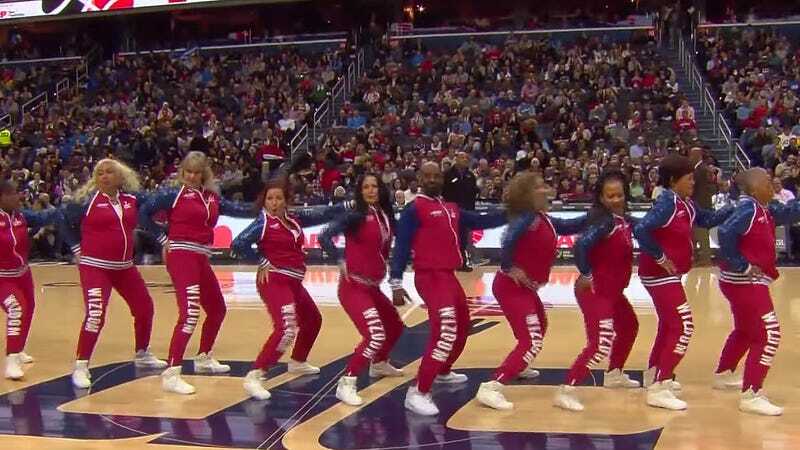 While most visions of NBA dance squads brings to mind young 20-somethings, a recent halftime show for the Washington Wizards showed that age ain’t nothing but a number. These wise elders know that one of the keys to life is found in living in fullest joy. Sponsored by the elder services company AARP, the Wizdom dance squad is comprised of 19 women and one man; ages range from 50 to 76, and includes former NFL cheerleaders, a dentist, several grandmothers, and a breast cancer survivor. They made their debut appearance for the Wizards in November and have performed at several home games since. For other team members, like Wizdom’s oldest dancer, Nana, 76,the team creates a space of healing. “I was laying around having a pity party cause I lost my husband eight years ago,” Nana told NPR, “ and my mother [passed away] two years ago and in between I had brain surgery....This is really lifting my spirits,” she says. While older dance squads may seem like a novelty, they’re actually part of a growing trend. According to NPR, Wizdom is one of at least a dozen other squads for dancers who are 50 or older in the NBA.